PORTLAND — The Tigard High School girls basketball team and the Tualatin High School boys basketball team had a few things in common. They both advanced to the Class 6A state tournament this year, and both squads took home a trophy from the tournament. Both teams also featured a group of key seniors, who were crucial to the team's success, both on and off the court. For the Tigard girls, the group of seniors included Xandra Britch, Gabby McGaughey, Caitlin Erickson and Hannah Jedan. 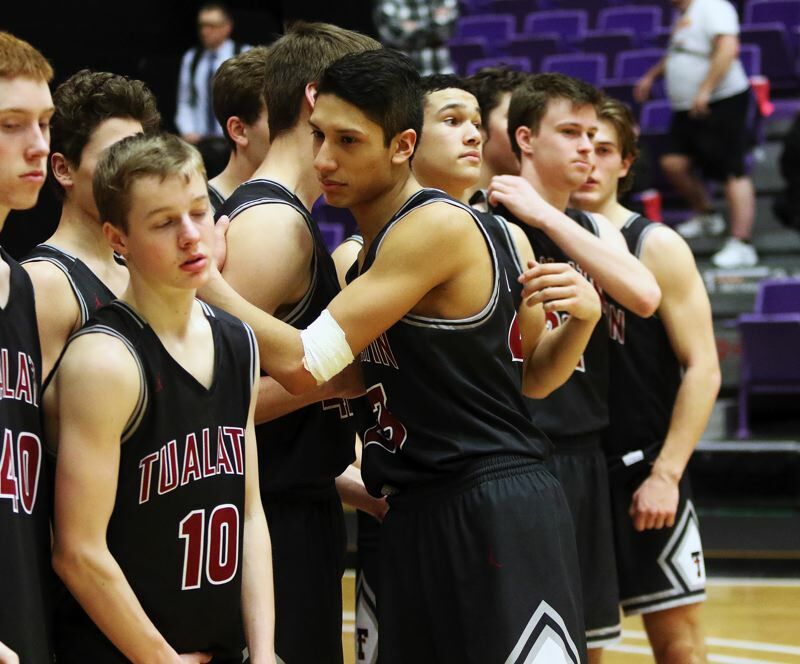 For the Tualatin boys, the group of seniors included Lucas Noland, Nathan Platter, Alexis Angeles, Chris Freese and Matthew Kachlik. "I love those guys," Tualatin coach Rick Osborn said of the Timberwolf seniors. "It's going to be tough to say goodbye. They gave everything they had for the program." For the Tiger girls, McGaughey, a guard, has been on the varsity roster all four years at the school. 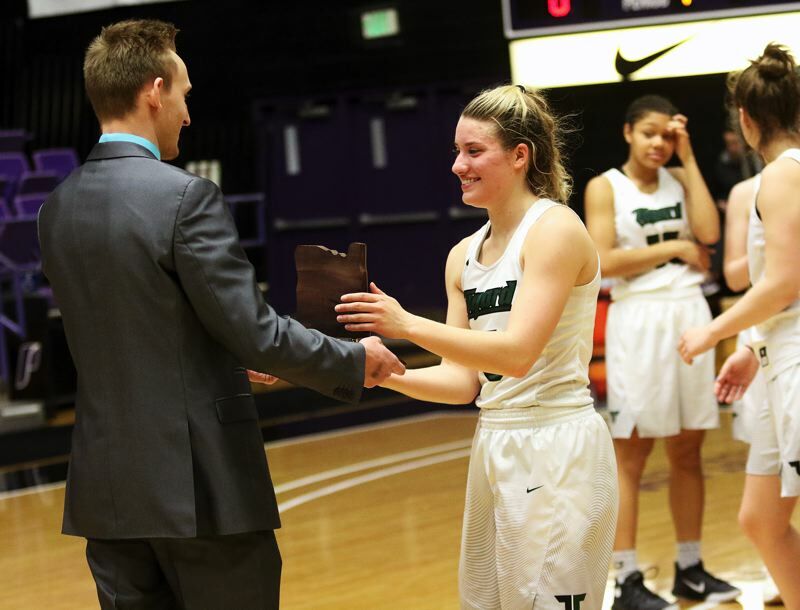 "Bittersweet," McGaughey said of her final game for the Tigers, a 54-46 win over Clackamas in the tournament fourth-place game on Saturday. "It was kind of a relief that we won, but, also, I didn't want it to end. I've been on varsity all four years, with coach (Steve) Naylor and Mallory (Goldammer) and coach Ash (Jason Ashley), and it's been great. I love them as coaches. It's been awesome." "I'm going to miss the seniors," said Naylor, Tigard's head coach. "Gabby played the most minutes, but we have three other seniors who are great girls. They're great in the classroom, they make the right decisions in life. They're players you need and are great people." "The seniors, they're great," Tigard junior guard Campbell Gray said. "I'm lucky to play with them, and we're going to miss them a lot." For Tualatin, Angeles, the two-time Three Rivers League Player of the Year, is a four-year member of the Timberwolf varsity. "There are a lot of great memories," he said of his four years at Tualatin. "A lot of ups and downs, but at the end of it, it just makes a perfect story for me, and I wouldn't rather play for any high school or city." "They were everything," Tualatin junior wing Caden Dickson said of the Tualatin seniors. "They were the guts and glue of this team. The leadership was great. They kept us focused." While the seniors for both squads will definitely be missed, both teams are also anticipating good things in the future. "It's definitely a burden to miss them," Dickson said. "We love those guys, but we're excited to see what happens next year." "I'm excited for next year, hopefully we'll make it back," Gray said.